The crazy mash up of all your favorite Final Fantasy characters is coming to North America on January 30, 2018 on the PlayStation 4. Together with the release date, Square Enix also announced the collector's edition, a steelbook edition with three designs available, and what you'll get if you decide to buy the game digitally. The Ultimate Collector's Edition is extra special since the only way you can get this collection is by ordering one at Square Enix's Online store. 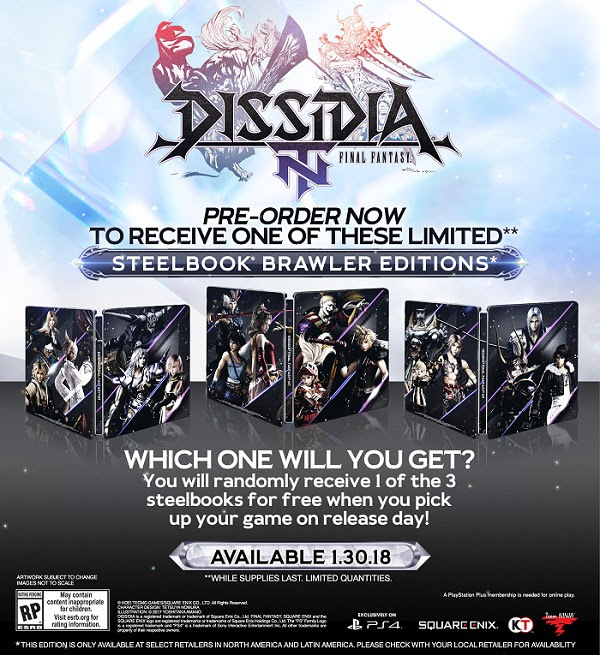 The Steelbook Brawler Edition, which will cost $59.99, will be for those that opt to pre-order Dissidia Final Fantasy NT at participating retailers. There are three steelbook designs that will be available, but you will randomly get only one on release. Those planning to pre-order and pick up the game digitally will score a mini-soundtrack consisting of five songs and access to the 'Nameless Warrior' character skin for Warrior of Light. A Digitial Deluxe Edition, which is priced at $84.99, is also available and will contain the game's Season Pass. For those that have access to Dissidia Final Fantasy NT's Closed Beta, it will run from August 25 through September 3. For those in North America, the registration is still open but will only last until August 20, so hurry up and register on Square Enix's website right now.